Back when Alphabet was known as Google, the company bought Boston Dynamics, makers of the amazingly advanced robot named Atlas. 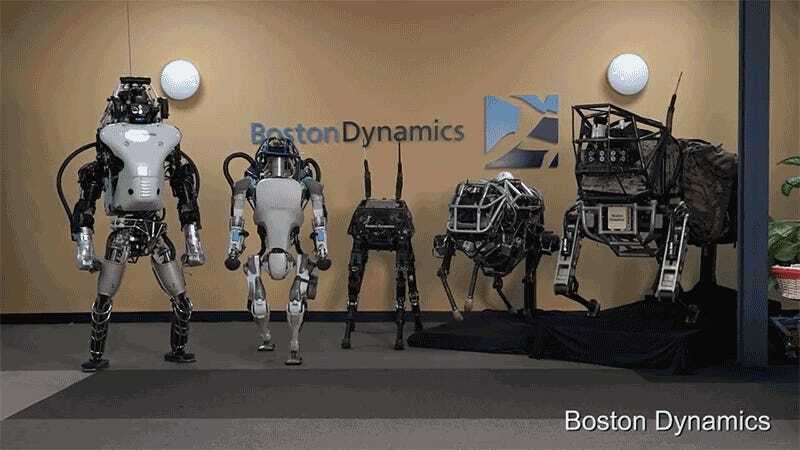 At the time, Google promised that Boston Dynamics would stop taking military contracts, as it often did. But here’s the open secret about Atlas: She can enlist in the US military anytime she wants. Technology transfer is a two-way street. Traditionally we think of technology being transferred from the public to the private sector, with the internet as just one example. The US government invests in and develops all kinds of important technologies for war and espionage, and many of those technologies eventually make their way to American consumers in one way or another. When the government does so consciously with both military and civilian capabilities in mind, it’s called dual-use tech. But just because a company might not actively pursue military contracts doesn’t mean that the US military can’t buy (and perhaps improve upon) technology being developed by private companies. The defense community sees this as more crucial than ever, as government spending on research and development has plummeted. About one-third of R&D was being done by private industry in the US after World War II, and two-thirds was done by the US government. Today it’s the inverse. In 2014, just after Boston Dynamics was acquired by Google, DARPA director Arati Prabhakar was asked about whether the agency saw Google as a competitor for developing high-tech machines—humanoid robots or otherwise. That term “harvest,” of course means that they’re going to use off-the-shelf technology of any private company as they like. “Off-the-shelf” being technology that’s available to practically anyone. And “driving technology forward,” can easily mean building humanoid robots to help US soldiers one day. Whether those robots carry guns or are involved in offensive capabilities of any kind scares people—many of whom are only half-joking when they make gifs of Atlas getting fed up and destroying all of humanity. But it’s an issue that society must grapple with very, very soon. The US military was dissatisfied with versions of Boston Dynamics’ BigDog, the robotic pack mule that was way too loud for the battlefield. But Atlas is getting smarter and quieter with every new iteration. RAND recently released a study arguing that drones hadn’t really changed warfare that much in the past two decades. And in some ways they were right. If you’re a civilian on the ground, you don’t really care if the person pulling the trigger is sitting in the plane above or in a room in Nevada halfway around the world. The same could be said of robot warriors. If you’re getting shot by a military machine (whether it’s someone in a tank or a robot being controlled by someone in Nevada) it doesn’t make much difference. The biggest concern for people of the future—whether it’s aerial drones or gun-toting robots—is whether humans are out of the loop. The term “out of the loop” refers to humans using their programming to react to problems without the intervention of a human. Swarms of “smart drones” acting autonomously to overwhelm air defenses could prove to be truly transformative weapons. But such capabilities, if they ever exist, will be transformative because of their autonomous systems more than the unmanned platforms that carry them. The same can be said of humanoid drones. Autonomy is key here. And the acquisition of systems built or utilized by the defense community that allow for machines to make decisions is crucial to the US military. We’re past the deliberative stage. 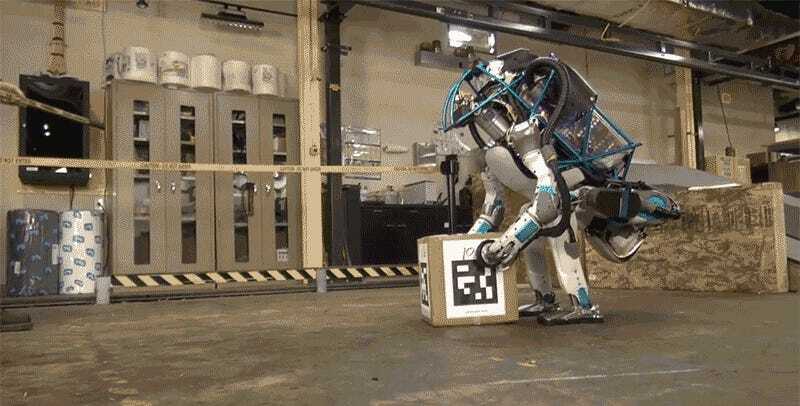 And just because Boston Dynamics may not actively be coordinating with the US military doesn’t mean we won’t see fully autonomous Atlas warbots in our lifetime. In fact, it feels more inevitable than ever. This past summer I saw robots drive cars, open doors, climb stairs, and drill through walls. Just replace the power-drill with a gun, and you’ve got the makings of a robot army. We joke about it now, given how comedically slow the robots of the DARPA Robotics Challenge were. But what the world saw were merely the grandparents of the robot war-machines we’ll see dispatched around the globe. Again, DARPA director Prabhakar was more than happy to explain how the agency uses the innovations of private industry in a 2014 interview. She also explained that it wasn’t just American companies they were relying on. As long as private industry keeps making amazing things that DARPA and the broader defense and intelligence community can capitalize on, it’s seen as a dollar saved. And in just a few short years, an Army of Atlas could be more affordable than ever. Let’s just hope we’re ready—not just for humanoid robots policing our streets and fighting along US soldiers. I’d wager that there are dozens of papers being circulated in the Pentagon right now about what the hell we’re going to do when Atlas is cheap enough to fight for terrorist organizations like ISIS. Contact the author at novak@gizmodo.com.